Smoke Inn Rewards - Start Earning Today! Deviating from the García family's usual strategy of introducing one new limited edition cigar each year, the family has instead treated enthusiasts to a second helping in 2018, offering a surprise "second installment" of their acclaimed Limited Edition series. 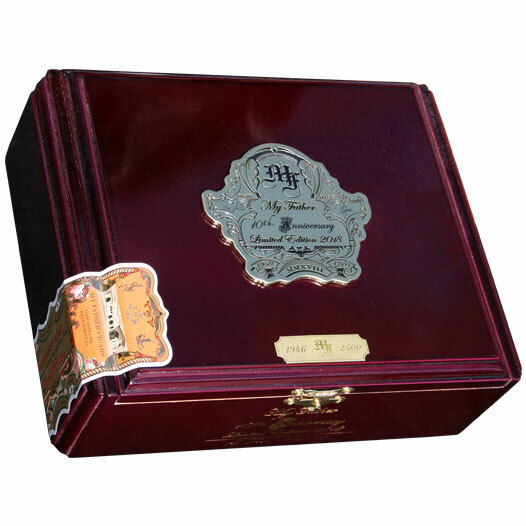 While the first Limited Edition release (Don Pepin Garcia 15th Anniversary) focused on the 15th anniversary of Don José "Pepín" García's self-titled brand, the family has now turned its attention to the My Father Cigars brand and its well-earned 10th anniversary. My Father 10th Anniversary Limited Edition 2018 will be a familiar sight for collectors and die-hard enthusiasts, showcasing a similar look to many My Father Limited Edition cigars before it. In fact, the blend has been rolled in the very same 6½" x 52 toro size as the very first MF Limited Edition cigar from 2010. And the tobaccos used are similar as well (at least on paper), offering Nicaraguan-grown leaves throughout the binder and filler, and being enveloped in an Ecuadorian Habano Rosado wrapper. As with nearly all of the García's most elite cigars, the 10th Anniversary LE 2018 includes the rare Pelo de Oro tobacco varietal in its filler—a finicky leaf that is difficult to grow but produces tremendous results. Only 2,500 boxes of 14 cigars have been produced, with each cigar being individually packaged in slide-lid cedar coffins. We consistently strive to offer cigar enthusiasts the best possible buying experience - this includes an industry-leading customer service, mobile-friendly layout, fast and affordable shipping (including international orders! ), consistently affordable pricing, and access to the most sought-after cigars on the market. Don't just take our word for it, here are some reviews that our past customers have left! SUBSCRIBE NOW FOR EXCLUSIVE SPECIALS! Smoke Inn is your friendly knowledgable online smoke shop. At Smoke Inn we are known around the world for our famous microblend series which features exclusive cigars by Padron, Arturo Fuente, My Father, and Tatuaje. When you are shopping for cigars online you can find the best deals on premium cigars as well as cheap cigars, humidors and all the best cigar accessories at Smoke Inn smoke shop. Welcome to Smoke Inn Cigars - where you can buy the best cigars online, or come in to enjoy a fine cigar with us in one of our premium cigar lounges in Florida. We've got 11 locations, including West Palm Beach, Port St. Lucie, Wellington, Boynton Beach and Pompano Beach. At Smoke Inn, we provide some of the highest quality cigars ever made at the lowest prices available online. Check out our fine cigar lines such as Padron, Tatuaje, My Father, Liga Privada, and more. Browse our great cigars online. Cigar purchases made online through SmokeInn.com are processed using the latest encryption and security technology standards, so you can feel confident buying from SmokeInn.com! All pricing on this website is for online purchases only. Copyright © 2006-2019 www.SmokeInn.com, LLC SmokeInn.com is not responsible for typographical errors. SmokeInn.com, Inc. All Rights Reserved. WARNING: SmokeInn.com does Not sell tobacco or tobacco related products to anyone under the age of 21. SmokeInn.com does NOT sell cigarettes.